When it's hot you need to look for flowers that won't go down the first day you get them home. These orchids with a succulent and an air plant were the ticket. There were still several unopened buds on the orchids. That's what you want to look for. Succulents and air plant last for months. The cement container is one of my favorites. There is a link above for the exact colors and brands of the ribbons you will need. You should get the green ribbon because it is hard to find the right shade of green ribbon. At the store, they all look green and it's hard to tell which shade to get. I have purchased ribbon I thought would work only to find it was the wrong shade. The Celery Green ribbon works with everything. It has a beautiful satin finish and it's wired. Actually there are a lot of links above for basic floral supplies that you will use over and over. It's a good idea to get a few supplies each month, so you have them on hand. I cut the bamboo from the yard. Bamboo is a pain because you have to find a place it can grow but where it won't spread. It is great however, to have Bamboo available for floral arrangements. 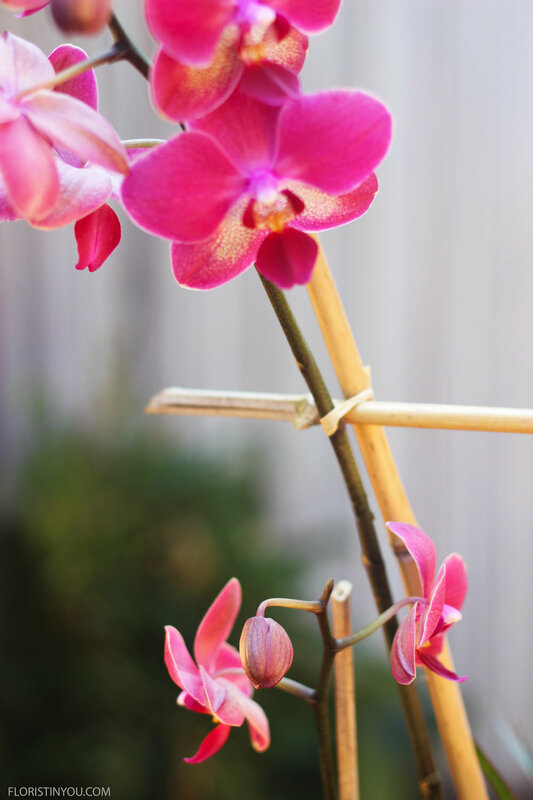 In this post, you will learn to make a Bamboo support for your orchids and tie them with Raffia so you can get rid of the ugly supports and clips that come with commercial orchids. Tying them with Raffia in a double knot is the traditional way to finish off orchids. The Bamboo supports gives the arrangement an interesting shape as well as support. Since there is a lot of space between the color of the orchid bloom and the bottom of the arrangement it helps visually to add a ribbon, twisting the bow at an angle, and an air plant at mid level adds interest. If you have your orchids, plants and supplies, let's begin. Put garbage bag in vase. Add potting mix and fill to 3/4 way to the top. Cut garbage bag at rim. First protect table. Spray top of orchid leaves with Green Glow. Place orchids first, then the plants around them. Keep them in their cups, with the cups a little lower than the rim of the vase. Take the Zebra plant out of its pot and plant it on the left. After filling area around with dirt. Water the Zebra plant. 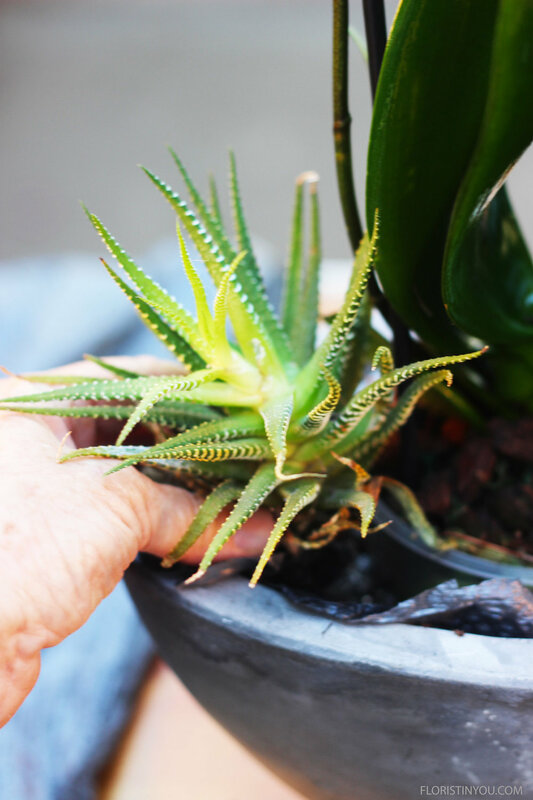 Fill around all plant cups up to their rim. On right, tie orchid, vertical & horizontal Bamboo with Raffia. Double knot & cut short. On left and middle tie other end of horizontal Bamboo to verticle Bamboo and Orchid. Cut moss with a curve and fit around plants. Fit moss in front and back. Tie Green ribbon in knot, then tie Pink ribbon in knot. Tie bow and twist to right. Wrap 6 inch piece Bind Wire around bottom leaves air-plant and tie to Bamboo. Then hot glue small piece Reindeer Moss to Bamboo. This is from the front. This is the finfished back.